Man’s 130-Pound Tumor Began as an Ingrown Hair! 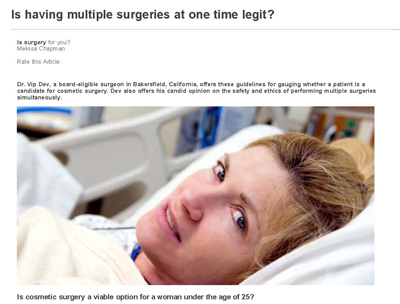 Bakersfield Plastic Surgeon Dr. Vip Dev offers these guidelines for gauging whether a patient is a candidate for cosmetic surgery. Dev also offers his candid opinion on the safety and ethics of performing multiple surgeries simultaneously. Local plastic and reconstructive surgeon, Dr. Vipul Dev stepped in to do the surgery for free. The bad economy mixed with the quest for beauty can turn ugly for some patients looking to save money on cosmetic surgery. ABC 23 was in the operating room with one woman who chose to get breast reconstruction surgery after she had a mastectomy. Lee Lyle has been living with half a skull since having surgery more than a year ago. Now a local doctor has offered his services for free. A Bakersfield resident named “Lola” was wanting to regain the shape she had before having children. Like many others, she looked for a better price on surgery and traveled to Mexico last year — a choice she says she’ll regret for life. Monday, the surgical team who volunteered to help a Bakersfield man get his life back, answered questions about the procedure. The nominees are out for the 2009 Real Heroes Awards.